Portland-based programmer James Moore hopes to inspire both compassion and political action. When many people think about video games, their minds fill with images of blue-furred hedgehogs and mustachioed plumbers. 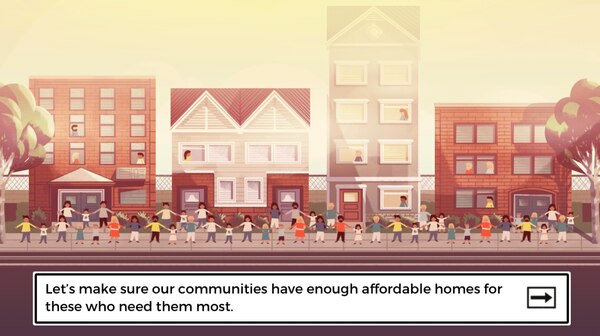 But while creating his new online game Can You Solve It?, Portland-based programmer James Moore has something else in mind: reducing homelessness. Moore is a lifelong gamer with a passion for social justice, though he says it "wasn't until the last couple of years until those things kind of started to melt together." 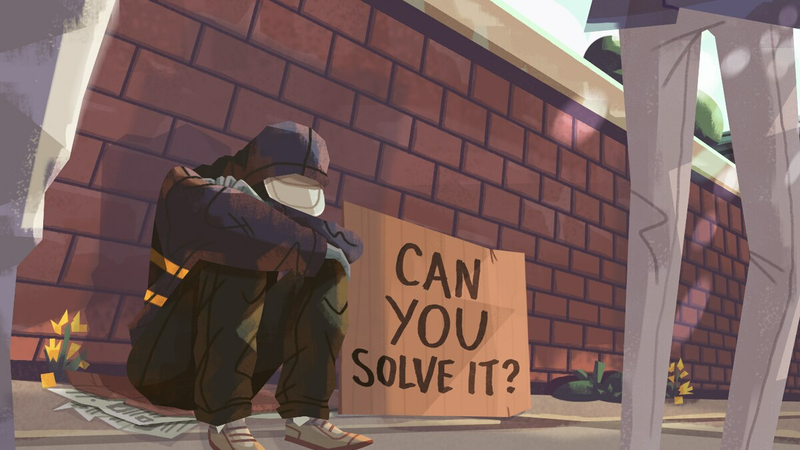 That melting resulted in Can You Solve It?, which can be played for free and asks players to help alleviate homelessness through both simple acts of kindness and political action. Can You Solve It? is the work of a team that includes animator and composer Brian Lambert, Moore and Jes Larson, Moore's wife. "My wife is a housing advocate and we had pitched game ideas back and forth for a number of years," Moore explains. "This was one that she came up with a couple of years ago. She and I worked on together somewhat, her mostly in the conceptual side of things." The concept of Can You Solve It? is a powerful one. 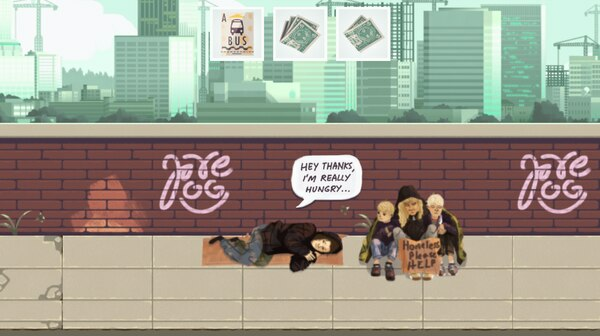 The entire game takes place along a brick wall where the gamer encounters numerous homeless people. As the player, you have the option of either walking by without doing anything or handing out food, money and friendly greetings. Moore says that the game was motivated by his desire to counter what he views as misconceptions about homelessness. "We have been told that, 'Oh, they're going to convert whatever you give them into drugs,'" he says. "Or, 'They made terrible life choices, so they don't deserve X.' We believe those ideas are just patently false." To counter those ideas, Moore says it was important to put players "in the position of giving things to people" to show them "that it's okay to give things to someone because they're a human being. It's just basic human dignity that you're serving." Can You Solve It? fulfills that mandate effectively. When you walk past someone sleeping on a sidewalk in real life, it's too easy to ignore them. Can You Solve It? forces you to take notice, an experience that breeds both empathy and a desire to take action. The game's simplicity is also a strength—the fact that you spend most of your time as a player simply moving along one street keeps you focused on the game's message, instead of getting caught up in the experience of playing it. Moore used a game development tool called Construct to create Can You Solve It? The game "wasn't programmed in the traditional sense that I was typing text commands," Moore explains. He says that Construct "tells you what you can do and you kind of chain the commands together." During production of the game, Lambert would create animated sequences which Moore would then weave into Construct. Moore says he wasn't satisfied enough with Construct to use it again, though he is proud of Can You Solve It? He also seems gratified by the experience of collaborating with Larson and Lambert. "The game wouldn't be nearly as compelling without Brian Lambert's great artwork or music," he says. "There are indie game developers who do absolutely everything themselves and those people are geniuses, but more often than not it takes a team of people."